What would be the purpose of writing a fraction and a decimal for each type of cookie in the bakery? Is this a natural application of fractions and decimals? It may be more motivating for students if they have to solve some task that involves both decimals and fractions such that they have to convert to one or the other in order to solve. You may find that it will be easier to do this if you can find a context in which fractions and decimals are being used *as numbers* rather than as ratios, e.g. 3/10 mile and 0.6 mile. The Common Core emphasizes that students should understand fractions as numbers like any other number. Like any number, a fraction can be used to describe how much of something there is, as number followed by unit of measure: 1/3 lb, 3/4 mile, etc. Furthermore, just as we can say that 4 is bigger than 3 without needing to say “4 of WHAT compared to 3 of WHAT”, we can say that the number 3/4 is larger than the number 1/3 because it lies to the right on the number line. The grade 4 standards for fractions assume students have this idea of fractions as numbers. 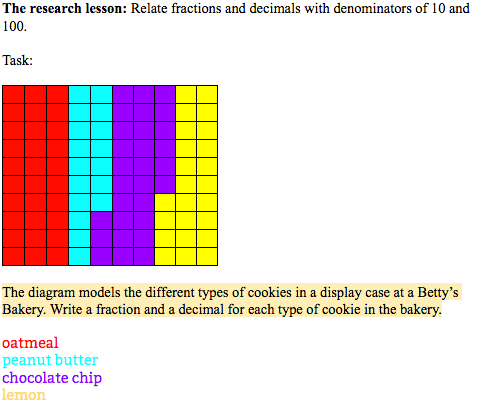 When we use a fraction to describe part of set – for example, we have 5 cookies of which 2 are chocolate chip, and we say that 2/5 of the cookies are chocolate chip – we are not using the fraction as a number anymore. We are using it to describe a ratio, i.e. a relationship between two quantities: the number of cookies that are chocolate chip compared to the number of cookies overall. The Common Core leaves the topic of ratios for grade 6. So it is not appropriate (according to the Common Core) to use fractions to describe part of a set until grade 6. Furthermore, although fractions are sometimes used to express ratios, decimals very rarely are. Instead, we are more likely to use percents, which are explicitly about ratios and are never numbers in the same way that decimals are and that fractions usually are. It remains to be seen whether the team will find my argument persuasive. Do you? Please comment below! Interesting! I’d love to hear from the team what they find appealing about the task. I like the distance context you proposed, and think it could make an interesting problem that better involves tenths as well as hundredths, which the current problem really doesn’t do very well (except for the red section). It did not occur to me that 2/5 of the cookies is not a number. I think of all fraction contexts as representing an underlying number, though it’s easier to grasp their “number-ness” when the context is continuous rather than discrete. But that may be my idiosyncratic understanding. Thanks for this interesting post! It boils down to: are ratios numbers? I think not, for two reasons. First, ratios cannot describe a single quantity the way other numbers can (e.g. 3 apples), but always describe a relationship between two quantities (3:5, red apples to green apples). One jar contains 2 cookies, one of which is chocolate. Another jar contains 5 cookies, 2 of which are chocolate, what happens when we add the contents together? Jar 1 + Jar 2 … 1/2 + 2/5 = … 3/8 of the cookies are chocolate! But 1/2 + 2/5 is supposed to be 9/10? ?